Just a reminder, especially to family and friends of the pilgrims, to please leave comments below. I read them to the pilgrims on the bus each day. Some are funny and the whole bus laughs. Thanks for joining us virtually on this pilgrimage. Another full and marvelous day ending with a meeting with the Bishop of Jerusalem who was born and raised and ordained in Bethlehem. Everyone is doing well and very excited. No injuries, illness or problems. All are completely safe and relaxed. This is a marvelous country and fear keeps so many from experiencing our Lord and Lady in this profound way. Janet and I have been here well over a hundred times and have brought thousands of pilgrims — with never a problem. Today we had an emotional Mass at Gethsemane. Afterwards we walked among the trees that are over 2,000 years old. If they had ears, eyes and a mouth they could tell you what they saw that momentous night. Then we went to the Pater Noster Church where Jesus taught his disciples, especially to pray the Our Father. He also ascended into heaven from this spot. They have the Our Father on the walls in over 160 languages. We walked down the Palm Sunday Road before returning for a free afternoon. Our pilgrims scattered all over the city of Jerusalem on their own to explore and pray. At 4:00 PM we had the best Holy Shroud Exhibit tour anywhere. After that we walked to the Latin Patriarchate to meet the bishop of Jerusalem. Fr. 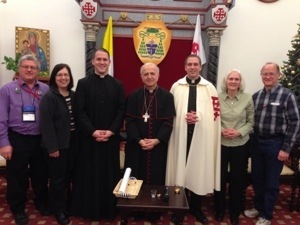 Romke received his pilgrimage shell from the bishop of Jerusalem. He greeted us all gave us a talk about the Holy Land. After a great day everyone had dinner and crashed into bed to prepare for another full day tomorrow. Fr. Romke receives his pilgrimage shell from the Bishop of Jerusalem.